This is an unofficial Wheeling & Lake Erie Railway railfan page, not affiliated with the Wheeling & Lake Erie Rwy. The Wheeling & Lake Erie Rwy official website is here. A much more thorough W&LE unofficial website (including a message board) can be found here. The main part of the Wheeling and Lake Erie (W&LE) is in Ohio. This page, however, only contains deals with the W&LE in Pennsylvania. 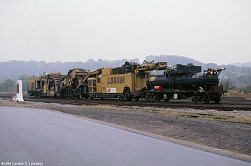 W&LE in Pennsylvania is the southeastern-most part of the railroad. The southeastern mainline runs from Mingo Junction OH east, through the WV Pahnhandle, and to Pittsburgh. From Pittsburgh the line runs south/southeast (railroad "east") to Connellsville. W&LE has trackage rights over CSX from Connellsville to Hagerstown MD. The W&LE mainlines are "dark territory". All train movements are authorized by Track Warrants, giving the railfan a possibility to listen in and locate the trains. Unfortunately crews that go on duty at Rook yard sometimes pick up the track warrant at the office and thus cannot be heard on the scanner. The W&LE uses 161.025 MHz (FRA channel 61) as their road frequency on the Pennsylvania part of the system. From West Belt Junction the West End Branch first branch runs some 2.3 miles to the CSX interchange at West End. The West End branch has been out of service for years due to a washout. 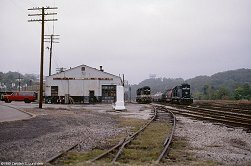 The Mifflin branch runs 3.5 miles from Longview Jct to the Union Railroad interchange at West Mifflin yard. At West Mifflin is also Tube City scrap, generating some traffic on the W&LE. 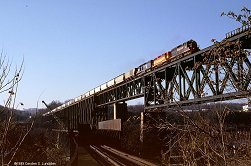 The 5.6 miles Clairton Branch from Pierce to Clairton (URR and NS interchange) has been out of service some years, but has recently been restored to service. At Belle Vernon the W&LE connects with the Monessen SouthWestern. 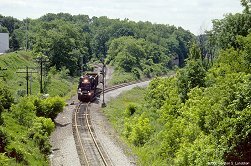 The connections is used for W&LE trains to access the cokeplant in Monessen. At Belle Vernon is also an 84 Lumber, but it seems it hasn't been served for years. At Connellsville the W&LE joins the CSX, and runs east to Hagerstown MD on trackage rights. 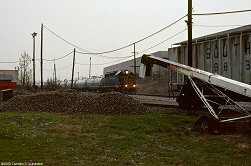 "I haven't been paying as much attention lately, but there is still usually an empty coke train 4-5 times per week to Monessen from Rook in the evening. This job usually returns in the early AM before dawn unless he outlaws, which happens a lot when they run traffic to the SWP, often on Friday night. The traffic runs west from Rook, usually in the early AM, with the empties coming in in mid afternoon. Tuesday or Wednesday often finds a unit steel train west from Mifflin. I believe they are running to Mifflin and Clairton as needed for general freight, but it seems as if a daylight Saturday extra from Rook has been running lately to these points." Apart from that, the "416" grain trains run infrequently to Hagerstown. Even in season it's usually at most one 416 per week. Watch the Bulletin Board as heads-ups are often posted here. We're west of Rook Yard, actually some miles west of Bridgeville. The 213 got away from me but a local switch job shortly after sped towards Mingo Jct. Unfortunately not with the brightest of locomotive paint schemes on display... Late May 2000. 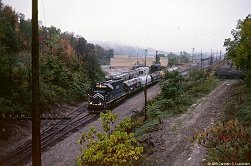 Sunday October 10th 1999, W&LE SD40 number 4016 was powering the 610 (the local to West Mifflin) out of Rook Yard on its way to West Mifflin with 6 empty coil cars in tow. Early June 2000. I ended up eating breakfast at the Greentree Cafe this Saturday morning. When I left, 610 was slowly pulling out of Rook yard towards Mifflin. The Greentree Cafe was a great restaurant for italian food and for a different breakfast. The cafe has since unfortunately gone out of business. I went ahead and caught 610 again at Longview Jct. The track going right is the main towards Connellsville, while the left track is the branch towards Mifflin Yard. Later the 610 is returning from Mifflin, also seen at Longview. 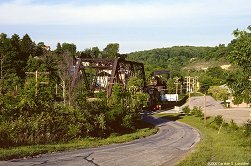 In the background to the right are the abutments from the overpass that used to carry the Montour over the main. The W&LE today uses a short stretch of the Montour to reach Mifflin. Note the long out-of-service signals from the N&W days. I believe they are gone now. And a little later again 610 is heading for Greentree Tunnel, just before entering Rook Yard. Back to October 10th, 1999, 610 was back at Rook in the afternoon. I believe it is GP35 number 2652 sitting in front of the yard office. My first experience with the W&LE was chasing around Pittsburgh after 610. I didn't know the area and I didn't find the train. I drove back to Rook to wait and see when it came back from West Mifflin. It didn't, but instead this ballast cleaner went through the yard and onto the main east of Rook. East end of Rook Yard again, 610 again... Mid May, 2000. 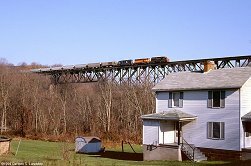 In the morning of November 27th 1999 I by coincidence caught one of the rare grain trains (train 416) to Connellsville (and further Hagertown). The grain train was powered by a mix of power about as colorful as the W&LE can come up with. In front was 3046, an SD40 in the current W&LE "Denver & Rio Grande Western" like paint scheme. Second unit was GP35 number 2662, third was MRL lease SD40-2XR number 257. Here is train 416 on the bridge across I279, just outside the Fort Pitt Tunnels. The bridge below is the West End Branch. Not exactly a shot to win prices, but the trestles near Rook deserve mentioning. November 27th 1999. 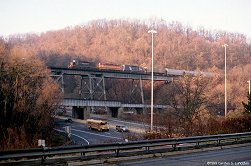 416 on the impressive bridge across the Monongahela River at Belle Vernon. The bridge is some 2 hours running time from Pittsburgh, plenty of time to get here by car. November 27th 1999. Finally, 416 on the bridge across the Youghiogheny River Valley at Banning. There is comfortable time (almost a half hour) to catch the train here from Belle Vernon, but not time for other photos on the way. Connellsville is a half hour away for the train. November 27th 1999.